Is there a better alternative to Image Converter? Is Image Converter really the best app in Image Editing category? Will Image Converter work good on macOS 10.13.4? 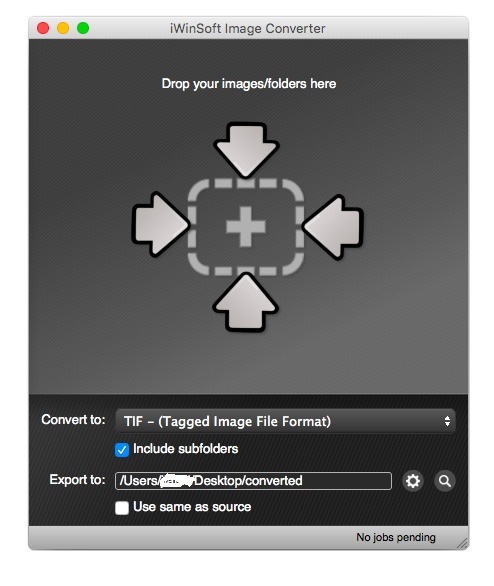 Image Converter lets you convert multiple image files to most popular image formats on Mac with ease. Supports batch conversion of all image files in a folder, or just one image by simply select your desired format and drag your image files or folders onto iWinSoft Image Converter. Image Converter needs a rating. Be the first to rate this app and get the discussion started! Supporting not only the main image formats as .JPG, .PNG, .BMP, .PDF, .GIF and .TIFF, Image Converter also reads and writes a wide range of specialized image formats, like EPS, PDF, SGI, PSD, SVG, JPG2, PCT, SGI, WMF, EXR, XMB, Photoshop PSD, and so on. Also supports convert RAW formats ( i.e CRW, CR2, NEF, PEF, RAF, X3F, RAW, BAY, ORF, NRW, SRF, MRW, and etc) to JPEG, GIF, PNG, TIFF, PSD, PDF, EPS, SVG, and more other image formats on Mac OS X. Converted image files retain their original name automatically. Image Converter supports RAW images from almost all DSLR digital cameras including Sony, Canon, Casio, Fuji, Pentax, Nikon, Olympus, Hasselblad, Kodak, Leica, Minolta, Panasonic, Pentax, Rollei, and etc. The main advantage of iWinSoft Image Converter is clear usage, just a few simple settings and fast results with only a few clicks. Image Converter is a perfect tool for both amateur and professional photographers and everybody to deal with images.